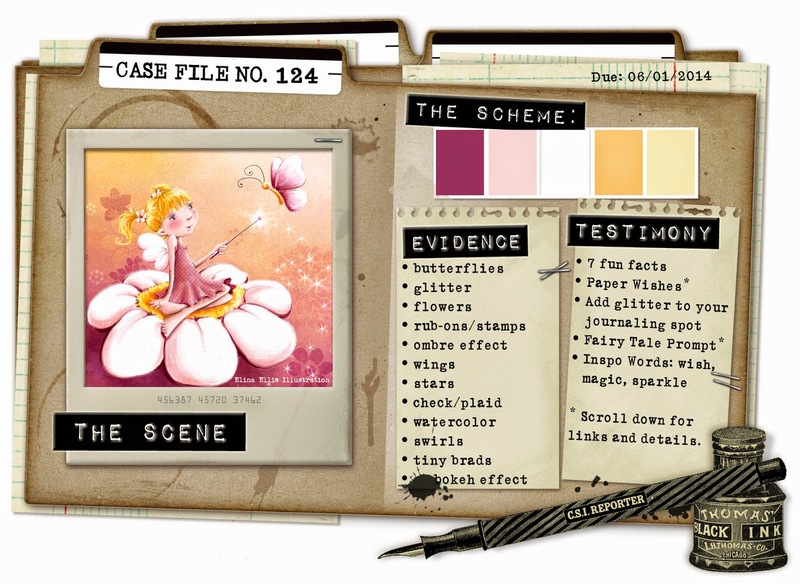 To crack the case, you have to use all five colours in the Scheme, at least two items from Evidence and at least one from Testimony to create a scrapbook page. This time, I decided to start with the Testimony before I even chose my photo - I checked out the Paper Wishes link and found a journaling prompt about what friendship means to you. I was inspired to dig out a photo taken during a visit to my dear friends, Maggie and Graham, in 2011, when I took my then fiance, John, down to Cornwall to meet them. I also used a sketch by the amazing Lizzy Hill which you can see in the current issue of Scrap 365! Lizzy's sketch was brilliant to work with, right up my alley - but did I follow all the clues??? Evidence: butterflies (on the fabric brad); glitter (on the fancy glittery brads); flowers; stars; check/plaid pattern (the houndstooth washi); tiny brads. Testimony: Maggie and Graham saw me through some very difficult times and showed me what being a friend really means. I was so pleased that they got along so well and so easily with John, although of course I knew they would. My journaling is a bit personal to share with the world, but I've written it on a slip of paper and tucked it between the layers behind my photo. As part of my mission to use up my scraps, I created this page by layering leftovers on a base of plain cardstock splattered with inks, then adding a "confetti" of tiny brads, sticky gems and wood veneer stars from Studio Calico, which I coloured with Distress Inks in Orange Marmalade and Dusty Concorde. All the different papers were distressed and inked in the same way to help to bring them together and I folded the edges over here and there, securing with staples for an extra funky detail. I also doodled around some of the edges with a fine black pen to add definition to some of the pieces. The little words were Typeset Stickers from the Simple Stories DIY collection - I mounted them on scraps of pp before adhering to the page with pop dots. More scraps were cut into triangles to make the banner and I did added more doodling to make them stand out better. The sunglasses were from the sticker sheet in the Chalk Studio 2 collection my MME - I stuck them to some of the "grape" paper first, then cut around the outline. The alphas were some lovely squishy Thickers - I had only one "L" left, so I used upside- down "7"s - genius!